See from the air the land the Union County, Florida, Commissioners will be voting on tomorrow. and by Our Santa Fe River (OSFR). 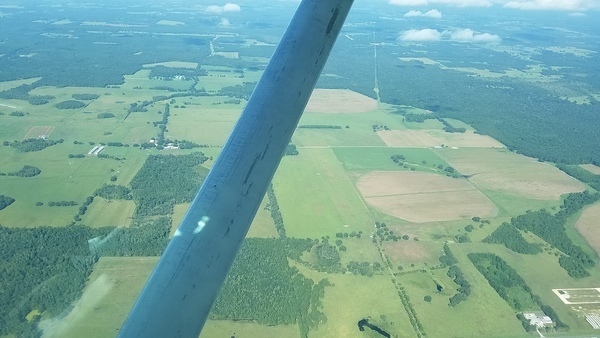 I took these pictures in Union and Bradford Counties, Florida, of the proposed HPS II phosphate mine site, on a Southwings flight for WWALS Watershed Coalition 1 September 2017. You can help figure out what some of them show. The main conclusion, already published in much briefer form by Jim Tatum with a few pictures he took, is that there was no sign of any heavy equipment or any mining. The pictures here cover the widest area of the overflight, and can serve as a baseline in case anything does happen. More pictures will follow. Thanks to Dr. Steve Pieczenik for a generous contribution to WWALS. And thanks as always to Southwings and Amanda Wheelock for making these flights possible. Some of these pictures from outside the mine site may seem unrelated, but mine proponents own large stretches of Union County west of the proposed mine site that could be added later. Similarly, another party owns a large area of Bradford County north of the proposed site that could be used for expansion. The FGT pipeline runs right through the mine site: what could possibly go wrong? And the towns, the rivers, and the confluence are some of the things that would be affected by phosphate mining. The New River at Lake Butler had a record flood during Hurricane Irma and seven days later is still in minor flood. Such floods would wash who-knows-what off the mine into the rivers. The New River joins the Santa Fe River just east of Worthington Springs, and the Santa Fe flows into the Suwannee and onwards to the Gulf. Plus contamination of the Floridan Aquifer from which we all drink can move in any direction underground. Follow this link for the 236 aerials. PS: Why are these pictures on the LAKE website and not the WWALS website? Tedious technical reasons. PPS: Yes, some of them will also be published on facebook. Photo: Jim Tatum. 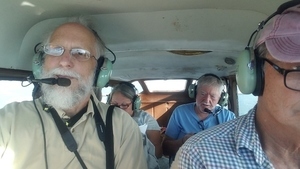 Left to right: John S. Quarterman, Suwannee Riverkeeper and navigator; Roy Zimmer, expert pilot; Carol Burton, local guide and master of maps. Thanks to Dr. Steve Pieczenik for a generous contribution to WWALS. And thanks as always to Southwings and Amanda Wheelock for making these flights possible. 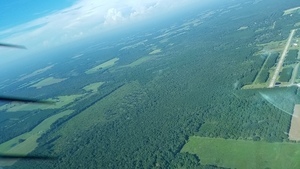 This entry was posted in Aquifer, Phosphate, Quality, Quantity, River and tagged Amanda Wheelock, Bradford County, Brooker, CAPM, Carol Burton, Citizens Against Phosphate Mining in North Central Florida, conservation, Florida, Flying Tiger Field, HPS II, Jim Tatum, Lake Butler, New River, north Florida, OSFR, Our Santa Fe River, phosphate, phosphate mine, quality, Quantity, river, Roy Zimmer, Santa Fe River, south Georgia, Starke, Steve Pieczenik, Suwannee River, Suwannee Riverkeeper, Union County, watershed, Worthington Springs, WWALS, WWALS Watershed Coalition on September 17, 2017 by jsq. What a great group effort. Thanks for being our eagles eyes.